NEW YORK, N.Y., March 11, 2014 (SEND2PRESS NEWSWIRE) — As the world’s leading data recovery solution provider, EaseUS Software recently announced its newly-developed data recovery software for Android devices – EaseUS MobiSaver for Android. The software offers users the easiest and most efficient way to find and get back their lost and deleted data from Android phones and tablets. It is truly good news for most Android users, especially for those who greatly rely on smart phones or tablets in their daily life. Since in the mobile device universe, approximately 78.10% are Android users around the world, EaseUS Android data recovery software have been downloaded by many users since its release. According to the reviews from most of the users, EaseUS MobiSaver for Android is well accepted for its user-friendly interface, powerful data recovery capacity and multiple Android OS version and devices compatibility. It’s reliable data recovery software to rescue lost data on Android devices. 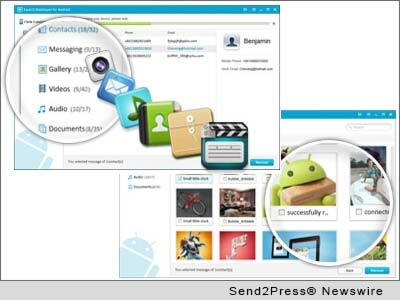 EaseUS Software offers two versions – including the free version and trial version – for MobiSaver for Android. Both versions work with Windows 8.1/8/7/Vista/XP and are equally efficient in Android data recovery. The software finds and retrieves lost data by scanning the Android devices and SD Cards inside the devices. The free version allows users to retrieve one file once. So for users who want to get back all the lost files one time, the trial version is better. * Recover deleted SMS, contacts, photos, videos, audio, documents from Android devices and SD Card. * Retrieve “data gone” due to deletion, formatting, restoring factory setting, rooting, etc. * Available for Android 2.3 and 4.0/4.1/4.2/4.3/4.4. * Supports multiple Android devices from Samsung, LG, HTC, Motorola, Sony, Google etc. * Preview all recoverable data and selectively recover what you want. * Read-only with no data damage, deletion and modification or personal info leaking. EaseUS Software is an innovative software developer which is dedicated to delivering the best software products and services for data security and storage management to the worldwide consumer and business market segments. Millions of people spread over 180 countries are now using EaseUS’ products and all speak highly of EaseUS’ software and service. For more info about EaseUS Software, please visit: http://www.easeus.com/. Image Caption: Free android data recovery software. Original Keywords: EaseUS Software, EaseUS MobiSaver for Android, free version, freeware, trial version EaseUS Software New York New York NEW YORK, N.Y.
REFERENCES: Mobile Technology News, EaseUS Software, EaseUS MobiSaver for Android, free version, freeware, trial version EaseUS Software New York New York NEW YORK, N.Y.